If you want a winning smile, we can help! When you look in the mirror – what do you see? Do you see a bright and beautifully aligned smile, or one that has dulled over the years, complete with chipped or uneven teeth? Do people compliment you on your teeth? Do you wish they would? If you want a winning smile, one that covers up those stained, chipped and worn out teeth, then maybe A Better Smile can help! We have an incredible technique that makes your smile look brand new again and we’d like to share it with you. Call us for more information on porcelain veneers. We’ll schedule an appointment for you to see about a “lift” for your teeth! Porcelain veneers are custom-fitted “shells” that are applied and bonded to the front surfaces of the teeth in your smile “zone.” They are used to cosmetically correct teeth that are crooked or misshapen or to cover up gaps, stains and chips in your teeth. In order to create a custom, natural fit, the doctor starts by meeting with you to determine the “look” you’d like to achieve, while checking the appropriateness of your teeth for veneers and obtaining the best color matches. Veneers correct dental defects and bring out that winning smile! 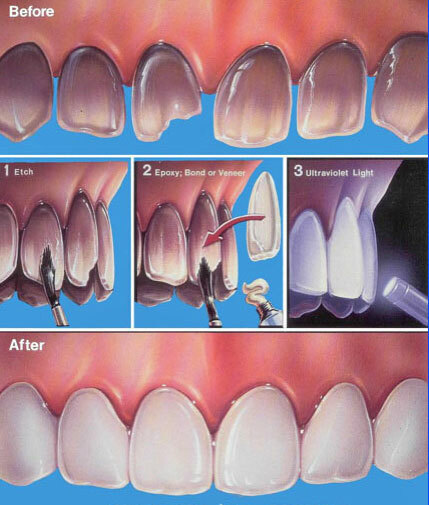 Next, the doctor lightly sands the enamel on the teeth to be fitted with veneers to maintain the same tooth thickness. Then, we take an impression of your teeth so the veneers can be shaped for a perfect fit, with the correct color and shape. While your new “teeth” are being made, we may place temporary veneers on your teeth until the permanent ones are ready. At the next visit, we will have you approve the color and shape of your new veneers prior to cementing them. Your teeth will be cleaned with a mild acidic solution and then a tooth-colored bonding adhesive is applied along with the veneers to cement them into place. Then the veneers are buffed to blend in with your other teeth. And Voila! A new smile! A happy face! Porcelain veneers are not only aesthetically pleasing, they’re functional because they protect your damaged teeth. They may also save you time and money and eliminate the need for more invasive crowns if the doctor feels they are a good “fit” for your teeth!